Making your own unique cake toppers for your cakes can be fun and rewarding. A Winnie the Pooh cake topper is perfect for a baby shower cake, birthday cake or a just-for-fun cake. Fondant is a great medium to use to make a cake topper. If you enjoyed playing with play dough or clay in younger days, playing with fondant will be just as fun. Fondant is easy to mold and will be very hard when it is dry, making it perfect to top your cake. Follow these step-by-step instructions to make your own unique Winnie the Pooh cake topper. 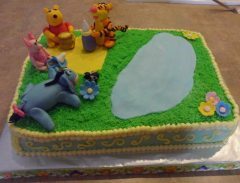 Remember that your fondant Pooh doesn’t have to be perfect to be perfect for your cake. Use the Winnie the Pooh topper alone or with other Pooh friend cake toppers to create a unique scene on top of your cake. Add some orange tint to the yellow fondant to create the color of Winnie the Pooh. The exact color of Pooh is a matter of preference. The amount of fondant you will need depends on how big you make your Winnie the Pooh cake topper. Using a piece of wax paper the size of the top of your cake can help you map out the decorations for the cake top and can help you decide how big to make Pooh. I used about a handful of yellow fondant when I made my fondant Winnie the Pooh figure. If you have a plastic Winnie the Pooh toy or picture, it may be beneficial to refer to it when shaping Pooh’s features. I used a Pooh figure to get the right shape of the face and ears. Begin by making Winnie the Pooh’s trunk. Roll some yellow fondant into a ball the size you want Pooh’s body. Shape it into a cylinder and flatten the top (so the head will easily sit on top) and bottom (so it will sit by itself). Next make Pooh’s shirt. Roll some red fondant flat into the shape of a rectangle. To cut the fondant to the right size, first measure the circumference of Pooh’s body to determine the length of the rectangle. Then determine where you want the shirt to end on Pooh’s fondant body and measure this width. Cut the red fondant to the length and width measured. Using a popsicle stick, make a small indentation at the top of Pooh’s shirt to shape the neckline. Use a small amount of gum glue to attach the red fondant shirt to Pooh’s body. Roll a small amount of red fondant into a “snake” shape. With glue gum, attach the red “snake” to the neckline of Pooh’s shirt. This completes Winnie the Pooh’s trunk. Optional Step: If you want your Winnie the Pooh cake topper to be attached to a popsicle stick, gently insert the stick into Pooh’s trunk from top to bottom. Leave enough stick at the top to attach Pooh’s head and enough stick at the bottom to securely stick in the cake. You may need to trim the popsicle stick to get the right size. This is an optional step. If your cake is level, you do not always need to securely attach your cake topper to the cake. Next make Pooh’s legs. Roll two balls of equal size with yellow fondant, each approximately 1/8 the size of Pooh’s body. Roll each ball into a snake shape. Press the end of one “snake” flat, so it will lay flat against Pooh’s body. At the other end, shape a foot by slightly bending the end upward. Repeat with the other leg. Stick a spaghetti strand about 1/4 inches long into the spot where Pooh’s leg will be attached. Attach the leg to the spaghetti strand using a little gum glue. Press and hold for several seconds. Roll two balls of equal size with yellow fondant. These balls should be slightly smaller than the amount of fondant used on the legs. Roll each into a “snake” shape. Take a small amount of red fondant and cover one end of each arm to make Pooh’s sleeves. Make sure the sleeve lengths are even. Stick a small spaghetti strand about 1/4 inches long into the spot where Pooh’s arm will be attached. Paint a little gum glue on the end of Pooh’s arm that will be attached to the torso. Stick the arm onto the spaghetti strand and press and hold for several seconds. Repeat with the other arm. Roll two small paper towels into a “snake” and use them to hold up the arms until they are dry. Roll a ball of yellow fondant about 1/3 the size of the torso. Roll two small balls of equal size and flatten them. Shape them into ears. Attach using gum glue or a spaghetti strand and gum glue. Use the bottom end of a decorating tip to cut Pooh’s mouth. Open the mouth slightly with the end of paintbrush or popsicle stick. To make the nose, roll a ball of yellow fondant slightly bigger than the size of the balls used for Pooh’s ears. Flatten slightly and attach the nose with gum glue. Make a smaller ball with black fondant and attach it to Pooh’s nose with gum glue. To make Pooh’s eyes, use Wilton tip #6 to cut eye hole out of black fondant. Attach with gum glue. Roll small black “snake” for the eyebrows and attach with gum glue. Royal Icing Option. It is sometimes difficult to work with very small pieces of fondant when making eyes and eyebrows. You may prefer to use royal icing instead of fondant. Pipe eyes using Wilton round tip #5 or #6. Eyebrows can be piped with Wilton tip #2 or #3. Hint: To make black royal icing, first make a batch of chocolate royal icing and then tint it black. When Pooh’s face is complete, attach it to his body. Paint a little gum glue around the popsicle stick and place the head on the stick. If you have not used a popsicle stick, place 3-4 strands of spaghetti in the top of the torso. Paint some gum glue to the head and attach the head to the torso by sticking it on the spaghetti strands. Place your Winnie the Pooh cake topper in a safe, dry place and allow to dry and harden for several days. Using Winnie the Pooh and his other friends, like Tigger, Eeyore and Piglet you can arrange them to create a unique cake topper for any birthday cake. Winnie the Pooh figures are popular as baby shower cake toppers as well. The Winnie the Pooh cake topper I made was for a Winnie the Pooh baby shower cake. Don't forget that fondant modeling does take practice and some trial and error. However, don't be afraid to give it a try. Keep in mind that any bear figure with a red shirt will be identified as Winnie the Pooh, no matter what imperfections exist in the figure. We can't wait to see your creation! Be sure to share photos of your own Winnie the Pooh cake topper with our cake decorating community. Making your own creative cake topper is impressive. Brag a little and show off your creativity. What medium did you use (fondant, modeling chocolate, etc.)? Did you have a model or create the idea yourself? Please share a photo of the finished product. Our friendly cake decorating community loves to see new ideas. Click on image to learn more about cake.